APPEARANCE: Hōsōgyo are kaigyo (strange fish) which live in the waters around Japan. 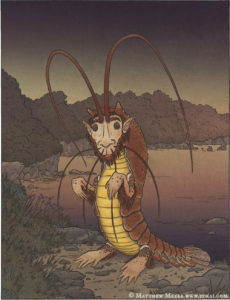 Overall they resemble shrimp, however they have heads like a shōjō (an aquatic yokai which resembles an orangutan), faces like that of a horse or a cat, and four large fins which resemble arms and legs. Their eyes look like large bells, and their bellies are golden and sparkling. BEHAVIOR: Hōsōgyo spend their days swimming about in the ocean like normal fish. During the night, they climb up from out of the sea and remain on the land until morning. INTERACTIONS: Because of their habitat, hōsōgyo rarely interact with humans. Very little is known about them. A hōsōgyo was reportedly discovered in June of 1838 on the beach of Uraga, Sagami Province. It was captured alive and quickly became a popular misemono sideshow attraction. ORIGIN: When the name hōsōgyo was first written down, the kanji for the second part of its name (sō) was written with an invented character which combined the words for red (赤) and appearance (相). Although it’s hard to say what the original author had in mind, it’s possible that the fish’s strange appearance reminded people of the hōō. Or perhaps the name was chosen to make it more appealing as a sideshow attraction. 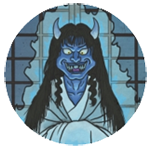 The only place this unique character appears is in hōsōgyo’s name. It is not a part of Unicode. As a result, it is displayed as an image instead of a font on this website.